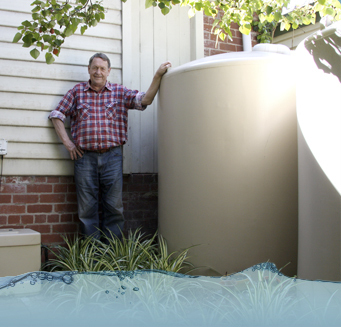 Welcome to the Tankulator: a free online tool which calculates what size rainwater tank best suits your needs. Click on the Get Started button, fill out the online questionnaire then click on the Get Tankulating button. An interactive graph will appear that will display your calculations. Compare the cost, environmental impact, life span and other specs of different types of tank materials. Hear what ATA members say about the tanks they have chosen. What will fit on your property and where to put it? Pros and cons of different approaches to placement and installation of your tanks. What kind of filtration do you need on your system? What degree of maintenance are you willing to undertake? Most rainwater systems will need a pump; what do you need to know? Also, pumps can use a lot of energy but there are ways to design your pumping system to reduce energy use. The Tankulator has been developed by the Alternative Technology Association (ATA), www.ata.org.au, Australia’s leading not-for-profit organisation promoting sustainable solutions for the home. The Alternative Technology Association (ATA) is Australia’s leading independent organisation promoting sustainable solutions for households. A not-for-profit ATA provides independent, practical advice on how to make homes cheaper to run, more comfortable to live in and environmentally-friendly.